← Bad self-defense advice: Idiocy or Malice? Gun enthusiasts are fond of making fun of pulp fiction writers for inaccuracies concerning gun descriptions. For example: “Joe eased the revolver safety off and carefully walked through the apartment.” Isn’t that funny, to think that revolvers have manual safeties? This Velodog revolver has it, a flag on the hammer. German Army revolver of 1879 had it. Many of the pocket guns of the early 20th century had it, and several of today’s designs do as well. Let’s read another example. “The zombies kept coming. Clara shot her revolver dry, ejected the empty clip and reached for another.” They are called magazines, not clips, right? And revolvers don’t have those…except when they do. 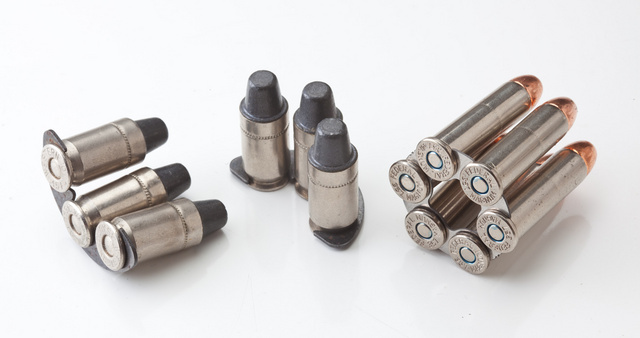 Half-moon clips on the left hold rimless 45ACP ammunition for use in American M1917 and converted British Webley revolvers. The full moon clip on the right holds .357Mag ammunition for quick loading of Chiappa Rhino revolvers. S&W625 also takes 45ACP in moon clips, and S&W940 does the same with 9mm. Taurus made a clip-fed 9mm for a time also. Going forward, let’s try this gem: “The noise in the small room was deafening. Holding the big gun with both hands, Peter shot from the hip. With each blast, a smoking spent shell casing came out of the cylinder and rolled on the bloody-soaked floor.” Revolvers don’t auto-eject, do they? Some do, using diverted cylinder gap gas pressure. So before you pick on the pulp fiction writers, consider the slight possibility that they might know their stuff. This entry was posted in pistol, weapon and tagged 12ga, author, book, humor, revolver. Bookmark the permalink. let us not forget Col. Fosbery’s 8 shot .38 revolver which used clips, had a safety and you had to rack the slide before firing. Oleg, I believe the Korth revolver also has a manual safety, or at least a lever that looks like one. But, let’s stop to consider, what’s more likely: author being ignorant, or the author is presenting rare knowledge without expounding on the fact to an audience who is not likely to get, nor appreciate it. Erik – [W]hat’s more likely: author being ignorant, or the author is presenting rare knowledge without expounding on the fact to an audience who is not likely to get, nor appreciate it. While there are some writers and genres (the Mack Bolan-type books leap to mind) where firearms are described with great attention to detail, I suggest that Erik is right in most other cases: the author simply has no idea what he / she is talking about. 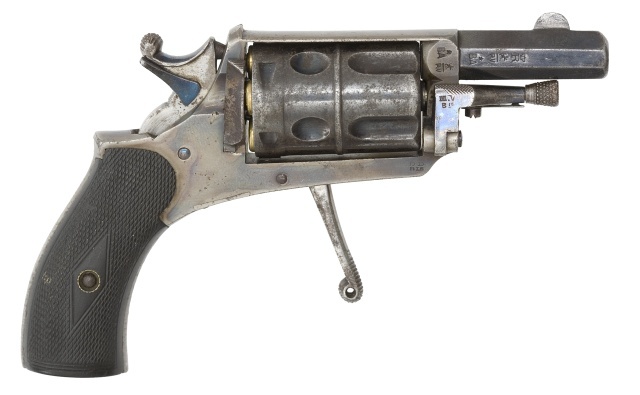 Autoejecting revolvers — don’t forget Jim March’s gas operated Frankenruger. That Ruger is what I thought of when I read auto ejecting revolver. Alistair MacLean was always one for great and spurious detail. Consider, e.g., the first couple of pages of When Eight Bells Toll, in which he tells all about the Colt Peacemaker, including this gem: “Another thing about the Peacemaker: because of the very heavy and varying trigger pressures required to operate the semiautomatic mechanism…” – huh? Does any part of that make sense in the context of the 1873 Single Action Army? But, then, the target audience wouldn’t have spotted the problems, any more than the editor did. And his books sold pretty well, right? Sometimes it’s point of view. I was reading an adventure novel. The hero was in the middle of a gun fight in the dark. He picked up one of the badguy’s cartridge cases, and was wondering whether it was from a 9mm pistol or .38 revolver. Generally, writers don’t know anything about firearms besides what they picked up from movies, video games, or bad novels. It’s ironic that writers who do meticulous research in some areas can’t be bothered to spend a few minutes online to discover that M4s are chambered in 5.56mm instead of “5.62mm”. That gem comes from a book by David Golemon. I am having trouble finding a shooting manual that shows the two-handed hip shooting technique. Can anyone help? When I hear hoofbeats, I expect horses.